Crisp, fresh blue and white is the beginning of a great room. 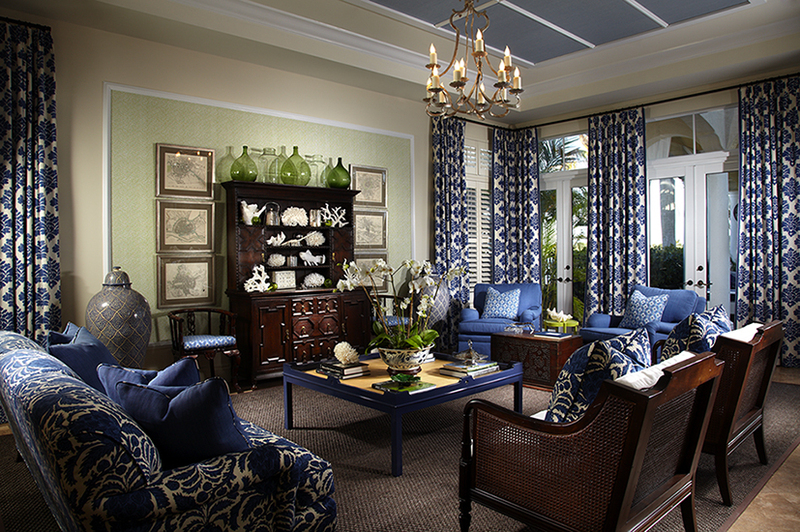 Combining textures, layering solid fabrics and prints, adding antiques and one-of-a-kind objects define this exciting room we designed for The Palm Beach Red Cross Designer Show House. By merging different textures, weights and patterns in the fabrics, upholstery and drapery, the design encourages your eye to keep moving throughout the space. To off set the fabrics, the largest wall is wallpapered in a contemporary chartreuse lime pattern from Quadrille. The Cowtan and Tout printed drapery, trimmed in a Samuel and Sons tape, frames the outdoor spaces and provides the signature sapphire blue and white pattern focal point. Two vintage domed and lidded Moroccan jars continue the blue and white theme, but with a touch of the exotic, and the custom Oomph cocktail table adds a punch of cobalt with a raffia textured top and to continue the refreshing theme. The large window facing the sea infuses sun light into the room which enhances the color story and helps to create the calm and serene atmosphere. Once the sun goes down this room is illuminated by a silver leaf Niermann Weeks chandelier with flowing lines reminiscent of the Art Nouveau period. Our goal was to use the colors blue and white as a foundation to layer not only colors, but patterns, textures and interesting hand-selected accessories revealing the curated lifestyle of a traveler.